The Nest Hello smart doorbell looks great, is a breeze to use and, even without the add-on features, quickly becomes indispensable. The downsides? It's hard-wired so you'll need a professional to install it and you'll fast become addicted to checking what's going on at your front door when you're not at home. Browsing smart doorbells to heighten the security of your home? Welcome the Nest Hello, which is giving the Ring 2 a serious run for its money. 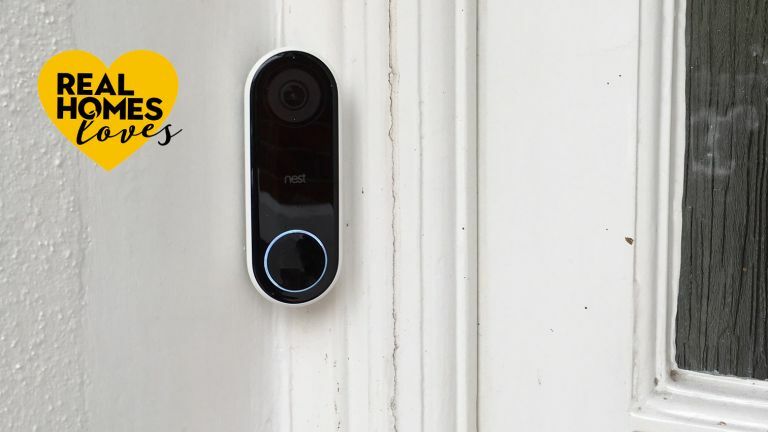 The Nest Hello looks stylish, has the HD HDR video you'd expect from a smart doorbell, an easy-to-use app and added features (for added cost), including facial recognition. Unlike the Ring 2, which can be battery-powered, the Hello needs hard-wiring, but at least you'll never have to change the batteries once it's in. Reviewed by RealHomes.com's Ed-in-Chief, find out how the Nest Hello stood up to our rigorous testing process. Who will the Nest Hello suit? Anyone who a) has a smart phone, b) likes to be able to check who's at the door before answering, c) hates to miss a delivery, d) likes to keep tabs on who's coming to their door (and who their teens are bringing in and out). The Nest Hello doorbell is slim and neat (W4.3cm x H11.7cm x D2.6cm), making it perfect for tight spaces around your door frame. It comes in black, with a blue halo that lights up when callers arrive. It's undeniably contemporary in its design, which may put off owners of period-style properties, but its compact, no-fuss design means it suits my Edwardian terrace well by simply blending into the background. What's the Nest Hello like to use? I quickly found this smart doorbell useful – first when a delivery arrived while I was out and I was able to ask the driver to leave it in a safe place (much to his obvious initial surprise at being addressed by a doorbell); then, later, when I was able to ignore a door-to-door salesman, having identified him on the video. So what happens when someone comes to the door? First, you get an immediate notification of either movement caused by a person or of the bell being rung (by the way, the bell does just work as a normal doorbell, too). Then, you simply tap the app and you can view the live video stream. The live stream has audio, so you can hear the caller and, if you tap the microphone button on the app, they can hear you, too. Assuming you have a good Wi-Fi connection, there's very little lag, so you can communicate pretty quickly (or just answer the door if you're in). With a slow Wi-Fi connection, they'll have given up and left by the time you get the app to react (or reach the door); with no Wi-Fi connection, you're as out of touch as you ever were with your old-fashioned doorbell when you're out and about. Here's what the app looks like on live stream at my door (see below). You can see it has a good 160 degree view (including a decorator's ladder in the front garden and my car parked outside) and it shows me what the weather's like at home, too. What else can the Nest Hello do? Well, it also allows me to look back at a three hour snapshot of activity at the front door (see below), and the camera's night mode is as clear as its daytime one – if night vision-tastic. Plus, I can quickly send pre-recorded messages to callers if I don't want to talk live (ie, 'Please leave the package in the porch') or if Wi-Fi connection is poor. How good does your Wi-Fi connection need to be? The quality of your home's Wi-Fi does dictate how good the video stream and recording are. Without good Wi-Fi, you'll get poorer recording quality and buffering. If you're stuck with poor Wi-Fi, you can adjust the video quality (you get three levels to choose from in the app) to speed up the Hello's responsiveness. With good Wi-Fi, though, resolution is fantastic, as is response time. Tip: A Nest Aware subscription comes with 24/7 continuous recording for up to 30 days. It allows you to scan through your entire video history to see what's happened, and to receive intelligent alerts, such as when it spots a familiar face. However, this does mean it uploads lots of data to the cloud, so if you're on a restrictive broadband plan you'll want to bear this in mind. How easy is it to install the Nest Hello? The Nest Hello needs to be hardwired to your home's mains electrics at an extra cost. You'll also need to buy a chime box too, if your home doesn't have one. We used a Nest-approved installer (expect to pay around £100) and, although he said it was a bit of a tricky job, he was quick (just over an hour), neat (he swept up after himself) – and even got me set up on the app. So, what was involved? The installer identified the best spot for the doorbell, we decided on the camera angle, then he drilled through the door frame, tacked a slender length of white wire along the inside frame and skirting to the chime (see the box below), with another hole drilled for connection to our electrics – all checked and agreed with me up front. With the Hello installed, I don't need to worry about changing or charging batteries, which is the downside of the Ring 2 (although the Ring's obvious upside is that you can DIY install battery-powered models). With the Nest Hello wired up, I downloaded the app (available on Android and iOS) and set up my account (you might already have one if you have one of Nest's other products, such as a smart thermostat; if this is the case, just add the Hello to your existing app). Set-up is surprisingly quick and easy, and before you know it, you're obsessively checking what's happening at your front door every few minutes (that compulsion wears off eventually, although the urge to text your other half with 'I didn't like what you were wearing when you left this morning' doesn't). With a Nest Aware subscription, you can have the Familiar Face function, which uses facial recognition to let you know who's at the door (you can assign names to those you know within the app). This means you'll get a notification when someone you know (aka, your kids) leaves or arrives home. The more someone comes to the house, the better the facial recognition is, so you'll find this part of the app improves with time. Subscriptions come in three choices: five day (£4 per month; 10 day (£8 per month) and 30 day (£24 per month) video history. Each subscription includes 24/7 continuous recording; intelligent alerts; clips and lapses; activity zones – handy if you have Nest security cameras indoors, too. The good news is that you get a 30 day trial of Nest Aware for free, so you can work out if you think it's worthwhile. Start with the five-day subscription to see how you get on with the added features – you can always upgrade later.